Civilization came crashing down. Billions died. A new Dark Age has begun. The descendants of the apocalypse's survivors scavenge the remnants of the Before Times, struggling to build a new life amidst the ruins of the old. In a savage world where the strong ravage and exploit the weak, the survivors' settlements are oases, connected only by convoys of armed and armored vehicles that run the gauntlet of raiders... and worse. Though the threats of chemical and biological agents and radiation have all but faded, their taint lingers on in every mutant born to man and beast. This is the world of Atomic Highway. 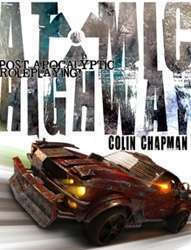 Atomic Highway is a complete roleplaying game. All you need to play it is this book, a few friends, paper and pencils, and a few ordinary dice. The V6 Engine: a simple, fast-playing game system that emphasizes cinematic, or "movie-style" action, supported with many clear examples. Quick and easy character creation rules providing dozens of potential character types. Tear along the shattered highway as a road warrior, track down monstrous threats as a brave tribal warrior, or unearth the wonders of the past as a canny scavenger. Rules for mutants and mutations, including optional rules for humanoid animals and psychic powers. Straightforward rules for a wide variety of vehicles and modifications. A complete bestiary of threats, mundane and mutated. Easy-to-use scavenging tables - you never know what you'll unearth. A customizable setting with advice and tips on how to create your own post-apocalyptic world. Roleplaying and game running advice for Players and Game Masters, new and experienced alike. While the Print On Demand editions are marked as color, the interior is black & white. The color printing method was a necessity of converting the older PDF to a newer POD format. Neither this pdf or Irradiated Freaks opens on my tablet, both keep crashing moon reader+ which is my preferred app to view pdfs. Any idea on how to fix this? I've tried different apps. Aside from not liking them, the pages take multiple seconds to turn. I have the original RAD print run of both the Core & 'Irradiated Freaks' and have just found out the rights have changed hands - the news about a possible revival is great to hear! Any word yet on what's coming next? Like the Supernatural/Alien Apocalypse sourcebook that was being planned for the 3rd book? Or is the idea to take the game away from a 'generic/DYI' approach & towards a more detailed meta-setting? Any chance of licensing or otherwise expanding the line now that rights have been secured? That will happen in the future! I bought the PDF a while ago, is there a coupon or code for us to get the book at a reduced cost? Also, the books are shown as "color". The PDF has exactly two pages that are color, the cover, and another page towards the end which has the company logo in color on another essentially black and white page. What is color on these? Unfortunately there won't be. Our profit margin on these is very low (we're only a few dollars over the cost as is), and we need to recoup the cost of turning the PDFs into POD. As for the color, there's two reasons. 1.) In order to have the Blacks in the art show up better (not washed out, or streaked) selecting color pages gives a thicker and better page for the art to get printed on. 2.) We can only offer the premium books in "color" printing. I'd love to get a print on demand. I did! Kinda went the round-about way! Another vote for print on demand for this book. Any chance you might offer this on print on demand? My group will need a spare copy.. I'm afraid RAD is a DOA company at this point.